Humanity has struggled with the delicate art of waking up forever, so it comes as no surprise that app developers would jump at the opportunity to tap into the iPhone’s capabilities to revolutionize the alarm clock. Melatonin from Orbicule sets out to do that, though in the end, the $1 app falls short as much as it succeeds. Early Bird: A cute animated bird (or a penguin or crab, if you prefer) helps you wake up with Melatonin. Shaking your iPhone or iPod touch turns off the alarm. The first thing you’ll notice about Melatonin is that it’s adorable, with graphics that look something like a mural you might paint on a nursery wall and theme choices of a yellow birdy, a penguin, or a crab on the beach. This gentle, soothing motif is the cornerstone of the app, which aims to wake its user up gradually. Unfortunately, these features don’t outweigh the amount of work required to use Melatonin. In the morning, you can tap the screen to snooze or shake the phone to turn the alarm off. The shake feature is particularly appealing, as my “slide to unlock” aim is not so great first thing in the morning. Now, both the sunrise and sunset functions are novel, but not entirely useful. 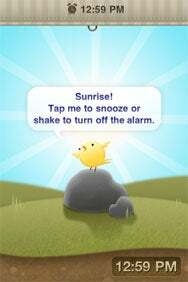 Sunrise basically means that the app turns on and slowly lights up more and more before your animated little friend starts playing music. Again, a great idea, but unless you sleep with your iPhone in your face in a completely pitch-black room, it’s not likely that you’ll ever notice the lights coming on. The sunset function is equally superfluous. After you’ve set your wake-up time, you tap your bird (or penguin, or crab) to signal that you’re going to sleep. The lights gradually come down, and soft music plays to lull you to sleep. You can tap the screen again to skip sunset, which I did, because I don’t enjoy the sound quality of the iPhone’s speakers enough to listen to it as I fall asleep. This isn’t to say that the option isn’t a cool idea—just that it’s not essential to the experience. But the app has other, more significant issues. Melatonin needs to be running in order to work, which means that you have to leave the app running all night. This can drain the battery, of course, but it also forces you to reset the alarm if you answer any calls or text messages in the middle of the night. This also prevents you from setting the next day’s alarm right when you wake up—and are therefore thinking about it—because even if you program a new time, you can’t set the alarm until you’re going to bed again. Because of this, the app can’t set any automatic alarms. I happen to like the iPhone’s built-in alarm clock, despite the abrupt awakening, because I can program it to wake me up at different times on different days, without having to reset it every night before bed. Even if you wake up at the same time every day, you have to remember to tap your little birdy goodnight in order to set the alarm. So, basically, to fully experience Melatonin, you must the set the alarm every night, then place your iPhone on a stand on top of your bedside table, then be sure to face your bedside table while you sleep. And, of course, you’ll need some heavy-duty blackout curtains. It seems like a lot of work just so that you can wake up on time. The app will satisfy those with a cuteness fetish, and at $1, it definitely won’t bust your budget. But overall, Melatonin feels like a good idea that’s just too much hassle in practice.